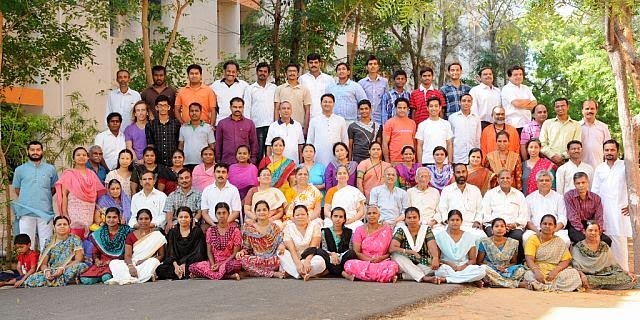 Vivekananda Kendra is propagating the message of Swami Vivekananda and Sanatan Dharma since 1977 through its Yoga Shibirs and Spiritual Retreats at Vivekananda Puram, Kanyakumari. The first Yoga Shiksha Shibir of this year was organized from 5-19 May 2014. In all 65 participants (Brother 37, Sisters 28) from 9 Indian States – Tamil Nadu, Kerala, Andhra Pradesh, Maharashtra, Gujarat, Uttar Pradesh, Assam, Arunachal Pradesh , Odhisa and 2 overseas Japan and Colombia participated in this 15 day event, which was simultaneously held in Hindi and English. The Participants are distributed in Five groups :Prithvi, Akash , Vayu, Tejas and Aap. Three groups for English and two for Hindi. The Camp day started with Pratahsmaran at 5:15, followed by Gita Pathan, Yoga Abhyas, Breakfast, Shram Samskar, Lecture-1, Manthan, Lunch, Geet Abhyas, Tea, Lecture-2, Yoga Abhyas / Meditation, Bhajans, Supper and Happy Assembly.In Yogabhyas Breathing exercises, Surya Namaskar, Asanas and Pranayama were practiced. Also amongst the Shatkriyas, JalNeti, VamanDhauti, Tratak, Kapalbhati were practised. During the Camp, lecture were held on: Concept and types of Yoga, Raja Yoga, Bhakti Yoga, Karma Yoga, Jnan Yoga, Bhagavad Gita, Swami Vivekananda, Eknathji Ranade, Story of Vivekananda Rock Memorial, Kendra Prarthana, Indian Culture, Challenges before Yoga way of life, Happiness Analysis, Vivekananda Kendra movement and its activities. A Special session was held on the Mananeeya Eknathji’s Centenary Parva and Question and Answers session. Daily Manthan was held on Book: “Yoga the Way of Life” and participants did presentations.During Geet Abhyas, practice of Bhagavad Gita Chanting, Shlokas, Stotras, songs, bhajans was held. Omkar Dhyan and Cyclic Meditation were practised. Devotional session: Bhajan Sandhya- with melodious music was a daily practice in the evening. Happy Assembly at night was the time for unwinding and sharing the talents by the participants in dance, music, Judo-Karate etc. Many group games too were held then. During the camp, visits were made to Vivekananda Rock Memorial, Devi Kanyakumari Temple, Gramodaya Darshan Park, Vivekananda Pictorial Exhibition, Gangotri and Wandering Monk Exhibition. Participants’ also visited Marutav-Malai hill, trekking to the top.Ma. Nivedita Didi gave the concluding address. In all the Camp was organized in a congenial atmosphere with moderate discipline. Many participants have expressed their desire to work for the society.